First, to let you all know, my sister-in-law is on the road to recovery. She has a long road to go and will most likely be in the hospital for several weeks, but the medical staff is using the phrase “out of the woods.” They also used the word “miraculous” so I want to thank all of you who have prayed for her life and health. As God brings her to mind, please continue to pray. And second, tomorrow is the first Joy Journal Project assignment of the new year! 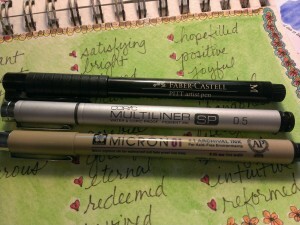 Since we will be using watercolor crayons and/or paints over our word for the year, I’d thought I’d share some of my favorite permanent ink pens. My all time favorite is the Copic Multiliner in the middle. Second choice for writing or line work is the Sakura Micron pen. 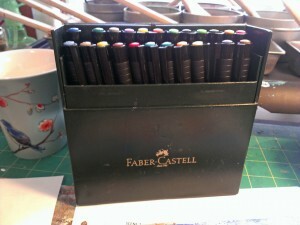 And third choice for me is the Faber-Castell Pitt artist pen, although I thoroughly enjoy using the Faber-Castell Pitt artist pen with the brush tip for coloring details. This is my go-to marker set. Now with watercolors, I am quite inexperienced. I have a few sets like we used in gradeschool. To play with them more extensively, I purchased a travel set of Winsor & Newton watercolors and really like the vibrancy and ease of use. 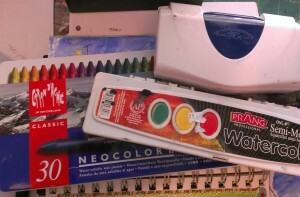 And of course, I use the Caran D’ache Neocolor II Watersoluble wax pastels for many different applications. What are your favorite watercolors and why? Tell me more!